In December 2011 the Russian government approved the LLC Mednogorsky Copper and Sulfur Plant’s copper-nickel mine project in Voronezh region. This project includes building several ore mines, a mineral processing plant, mining waste storage facilities, reservoirs, warehouses, and a railroad terminal. In 2012 the company started search and evaluation work at the location. The project development details were occulted from the public, the same as the results of ecological expertise. Local residents, scientists, national and international environmental NGOs, political and human-rights organisations were of the opinion that the project would have negative effect on local ecosystems of the Khoper River (the cleanest and most crucial tributary of the Don River) and the Chernozem (Black Earth) Region (the key agricultural area), as well as on health and livelihoods of the local population. The opponents of the project organised a series of protests during 2012 and formed the ecological movement “Save Khoper!” demanding the cancellation of the project. 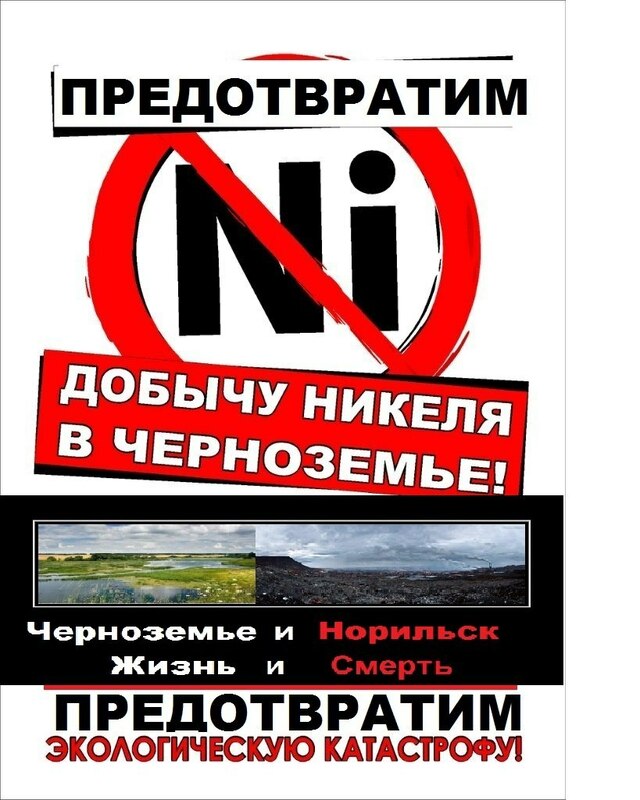 On March 10, 2013, Sputnik News reported that, "Hundreds of people rallied in a village of Russia’s Voronezh region Sunday protesting against the projected launch of nickel and copper mining ventures. The demonstration gathered at Novokhopersk, a village of some 10,000 people, to protest against the plan to start a copper-nickel mine. The police put the number of demonstrators at 1,400, while the event organizers said at least 5,000 people from several regions showed up. Last year, the Ural Mining and Metallurgical Company (UMMC) won rights to the two region’s nickel deposits, opened between 1970 and 1980. But local residents, backed by Cossacks and environmentalists, have been protesting the project since last spring citing fears that it would threaten the region’s unique environment and contaminate its agricultural land" (1). In 2013 the LLC Mednogorsky Copper and Sulfur Plant initiated a criminal case against the movement leader, and police has interrogated and inspected members. The opponents attempted to organise a local referendum on the issue but did not manage to get permission. Despite the fact that the Russian Federation's Constitution states local people rights to decide on matters concerning underground natural resources, the local population was never consulted in respect. According to the latest decisions from 2017, the extraction of nickel near Voronezh was considered useful and although some additional permissions will be needed, the mining enterprise construction is planned to begin in 2021. The activists continue fighting against the project. Project Details The Khoper Nature Reserve is an important bird sanctuary and home to the almost extinct Russian desman, a small mammal from the mole family. Threatened by large copper-nickel mine. According to the company (2), "Ural Mining and Metallurgical Co plans to start construction of a copper-nickel mine in the Voronezh region of Russia in 2018. Ural Mining and Metallurgical Co plans to start construction of a copper-nickel mine in the Voronezh region of Russia in 2018, after winning rights to the resource from the Russian State Committee on Mineral Resources. Ural’s Mednogorsky Copper-Sulphuric Plant (MCSP) will be permitted to mine and process nickel ore at the Elkinsky deposit in the Novokhopersky district of Voronezh as soon as it completes a geological evaluation. The activities erected the ‘protective cross’ at a proposed mine location. Other Salinization of soils and surface waters with brine of bromine and iodine salts coming from deeper soil layers if disturbed. Development of Alternatives The activists demanded from the federal and reginal authorities to cancel the project, as well as to ban extraction of coloured metals in the entire Chernozem Region. In their opinion, the region should be oriented toward tourism and agriculture. The activists also required liberation of their arrested colleagues. Why? Explain briefly. The extraction of nickel near Voronezh was considered useful and the construction of mining enterprise is planned to begin in 2021. The ecology of sanctions, Open Democracy, KONSTANTIN RUBAKHIN (8 September 2014). On the run in Russia, Open Democracy, KONSTANTIN RUBAKHIN (3 July 2014). Protestor against the mine in the Black Earth region The sign reads "Khoper is ours"
Other Comments The "Safe Khoper" activists were accuse with the “preparation of the extremist activities” in order to make them quit their fights, same as have already happened to other Russian environmental activist involved in other conflicts such as Khimki forest. The sign reads "Khoper is ours"